The destruction of the town at the hands of Prince Llewelyn, in 1260, provided a graphic demonstration to the Earls of Pembroke that the defences of Tenby were inadequate for the important role they wished to play in the colonisation of the south of the county. It was decided to increase and extend the scope of the existing flimsy defences of the town so that the entire settlement would be enclosed behind an impregnable ring of walls, towers and gateways. Within these structures the cliff-top castle would form yet another defensive bulwark. At the same time a new street pattern would be imposed on parts of the new town. 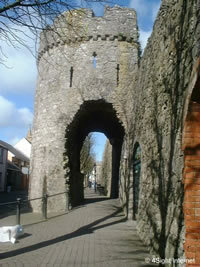 Construction of the new walls began under William de Valence, who became lord of Pembroke around 1264. 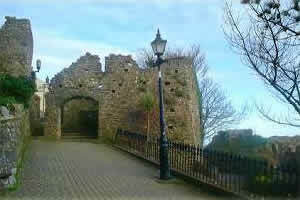 In 1328 Edward III granted Tenby the right to levy dues on merchandise entering the town for the next seven years. This order had two purposes: to help with the construction and maintenance of wall and defences - murage; and of quay - quayage. The funds raised led to the construction of extra towers in the curtain wall and the outer Barbican tower for the West gate - the present Five Arches. In 1457 Jasper Tudor's Letters Patent made the Mayor and burgesses of the town fully responsible for the upkeep of the walls and the defence of the town. This led directly to the lower sections of the walls being increased to six feet in thickness, to the walls being considerably heightened, and in many places a parapet walk added.